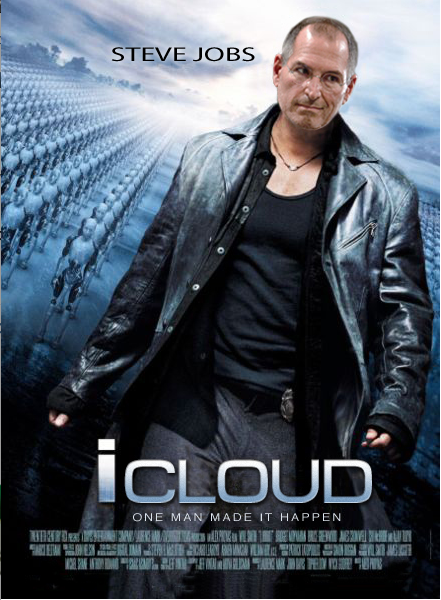 Come on, you knew the “I, Robot” movie poster mockup was inevitable the instant the “iCloud” term got its first official mention in Apple’s press release. The European filing covers twelve classes: delivering digital music by telecommunications, electronic storage, online social networking services, multimedia content for a fee or pre-paid subscription, computer software, electronic books and magazines, entertainment, photographic services, business management and advertising services, games, headgear and digital devices/computers. The iCloud looks to be way more than a MobileMe rehash. Think cloud locker that scans your iTunes library, making available matching media for streaming without the need to tediously upload your music, movies and TV shows to Apple’s servers. Hope this works with all media, not just the iTunes Store purchases, though. As good as the movie poster you posted looks, it was seriously lacking. Skin tones, fonts, layer styles, ect were all off. The image under “iRobot” was just blurred instead of making a clean rendition. When something bothers me enough I can’t resist redoing it myself. I also think this pose and facial expression more closely matches the original poster.